Custom Communication Solutions, LLC - FREE TV! There’s no need for cable or satellite services anymore! Now you can receive non-premium channel, high-definition television broadcasts for FREE with a DUV antenna from DigiTenna. 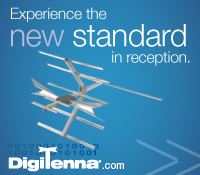 If you’ve been waiting for a solution to the skyrocketing costs of your home entertainment, it’s time to enjoy the “peace” of mind only a DUV antenna from DigiTenna can provide. DUV antennas are the smallest, most powerful VHF-Hi/UHF antenna produced. Custom Communication Solutions is an authorized dealer and certified installer of the Oostburg-manufactured DigiTenna. Contact us to learn about the dozens of free, high-definition channels that are available in the Milwaukee/Green Bay area without expensive monthly fees.